From the manufacturer:Lids are made of FDA and USDA approved, food grade product known as Polyoxymethylene Copolymer (POM) or Acetal Copolymer. They DO NOT contain any Bisphenol A (BPA). Just a reminder: Tighten the rings! Just a reminder, these are not typical metal canning lids. When using these lids, you have to back off the ring tightness a tiny bit before putting the jars in the water bath. Even more important, you have to Tighten the ring when the jars come out of the water bath. It means handling the hot jars, but if you don't tighten the ring the moment they come out, you will get failure. A lot of it. This is the 3rd year that I've used the lids and rubber rings. They've worked great on pickles and other hot water bath canning, and even my pressure canning. However, this is the first year that I'm having 50% failure on them sealing. I'm not done with my canning for the year so we'll see where things stand at the end of canning season. I have been using these lids for several years now. I am on the 9th round of using the original set I had bought. Still seal perfectly. I started using them as I keep my canned goods in the basement due to limited space upstairs, and these lids will not rust from dampness. Now I use them because with every re-use of them, it saves me money!! VERY happy with this product. Very disappointed that a number of jars lost their seal in storage. I was hoping they would work, but I am glad I only bought a few packs. Not worth the money, frustration and hassle. I had initially given this product a poor rating, because I'm dumb. I've been canning for years using conventional disposable lids, with a 100% success rate. I saw the ads for these reusable lids, read the instructions, watched the videos. I THOUGHT I had done everything as precisely identical to the instructions as I could. Long story short; I got a 50% rate of failure to seal. But I'm an idiot and didn't read the bold caps on the box that say you should tighten the rings firmly as soon as the jars come out of the canner. After PROPERLY following the simple instructions I'm getting 100% success! I will be ordering more. Thanks for a great product, and sorry for being a dolt. 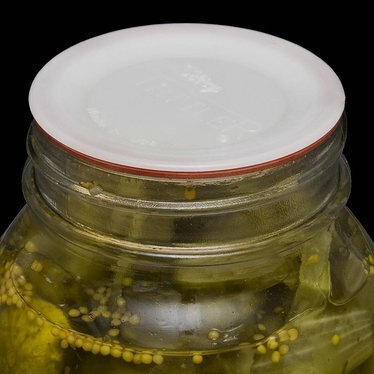 I've used these lids two years now, mostly on pickles. Great lids! You do have to back off the ring before processing as one commenter noted, but just as important, you need to tighten the ring when they come out of the water bath in order for them to seal properly. As for the plastic, it should not be heated above 460ﾰ per Tattler's website, far above home canning temperatures. Otherwise the plastic appears to be food safe. The rings are latex-free too. It's good to at least have an alternative to the BPA lids. I wanted these lids to be wonderful. I really did! I pressure canned over 300 quarts of food with these, trying to get a success rate equal to traditional metal caps, to no avail. The directions that came with the product were different from those I got when I finally called the company. I tried hard to like them, but what's to like about jars not sealing, as well as jars on the shelf not being sealed weeks down the road?? I also was leary of the plastic... I do not recommend these lids to anyone! I love these lids. We have used them to water bath, pressure can and for grape juice. They have worked great for us. I love what a great money saver they are. I was always running to the store for more canning lids, I stocked up on these and don't ever have to run to the store in the middle of a project (well at least for the lids)! Wow, why are these lids still allowed to be used near food? Look at what they're made of. Copolymer plastic which is loaded with formaldehyde. The manufacturer of the plastic has warnings about not using them with heat, not using them with salt, not using them with acids. County extension agents have been warning people about the plastic in this lid for a couple decades. People need to research! I absolutely LOVE these! They're a little more difficult to use than regular lids but they're much healthier so it's totally worth it. I've been canning with them for three seasons now and I have yet to have any problems. I always make sure to get the jar rim clean and ensure that when you're screwing the ring one, the lid and rubber don't slip. The biggest problem I have with these is that sometimes people just throw them away or keep them for themselves! Love these lids. This is my first time using these and had 100 success. I got these because they are reuseable and best of all BPA free. I'm ordering more. These lids are awesome. Heavy duty and reuseable. Also BPV free. I will now only use these lids. I canned tomatoes last weekend and used the reusable lids and I absolutely love them. I had read many positive reviews and decided I needed to try them.....I will use nothing else!! Thank you providing such great customer service, I told my family members about you and I will definitely order from you again!!! Also it is almost impossible to find bands for canning jars and was so glad I could order them from you...thanks again! I bought these last summer because I'd been having problems with lost seals on my tomato juice for the past couple of years. (I suspect the metal lid makers stopped using BPH to protect lids from acids.) Anyway, these have worked great! I didn't have a single lost seal. I am now on the website to buy some more for this year. These bring back the old days when mom used to preserve food,vegatables, fruit.....Couldn't do with out these jars around.Economic times are hard but these jars help stretch the dollar. I am very pleased with these reusable lids, and am planning on buying more. I found it very important not to tighten the lids too tight until AFTER they had processed in the pressure canner. The first batch were tightened down too tightly and the jars could not vent properly and bulged out a bit. They worked out fine anyway, as they vented when I went to tighten them. Everything sealed up perfectly. I can't remember if I bought these from Lehman's or from Tattler directly--either way, these are quite possibly the greatest invention for home canning since the jar itself! I purchased and used my first batch two years ago with flying results to this day--tomatoes, pickles, meats, soup stock--all have remained sealed until use. Between these and the bulk metal lids Lehman's sells--you'll be set for whatever may come! This is my first season using the Reusable Canning Jar Lids and so far, so good! I am very pleased with the way they work and plan to purchase more for next season. The lids work flawlessly! The plastic is BPA free - keeping you and your family healthy and chemical free. The method is almost exactly the same as metal lids, and the rubber rings only need to be turned (used side is identified by dents from the lids) between uses. I wanted to stop wasting metal and money, and I'm so glad I invested in these! Lehman's Tester wrote: So far they are very very easy to use. prepare them exactly the same way that you would the regular lids. put the rubbers on the plastic lids and wipe the rim of the jar clean (as normal) put the lids on followed by the band. seat the lid with the band and back off a quarter of an inch. Backing off allows for the air to escape the lid during the canning process. Process as normal (I used the 930A pressure canner - love the capacity to process a mess of jars at a time) when done, remove the jars and allow to cool completely. I test the lids by lifting the jars via the lids if the jars come up the lids are sealed. As far as the longevity of the lids (supposed to last for 20 years) I cannot say for sure as this is my first go around. The same holds true about reusing them. I understand that your supposed to flip the rubber over every time you use them to ensure even wear of the rubber. However I am still a bit fuzzy about how to tell which side you used before.